#ROHmixedbill Hypnotic work across the company. Brilliant dancers seizing their moment. & the After the Rain pdd. Sambé sensational in #ROHmixedbill. He is becoming a star. I really loved Human Seasons. Flight Path was powerful but not balletic to me. #ROHmixedbill. @MNunezOfficial so lovely in the PDD. And Flight Pattern is extraordinary. Powerful, gut-wrenching. What an ensemble. Wept. What did you think of The Human Seasons / After the Rain / Flight Pattern? The Human Seasons / After the Rain / Flight Pattern runs until 24 March 2017. Tickets are still available. Devastated to come all the way up from Wales to find the amazing dancers I had booked to see were swapped .Expected superstar Vadim Muntagirov and James Hay .ROH outrageous to put them in other cast .......Why bother to print cast if no notice taken??? I know people get injuries but neither Vadim or James is injured......Unhappy ballet watcher from Wales - may not bother next time - people in Wales pay taxes too!! Sorry to hear you were disappointed with your visit. We try to avoid changing casts as much as possible, but sometimes due to illness or injury we have to make changes, which we announce on the website as far ahead as we are able for all Principal roles. Occasionally these cast changes have knock-on effects for other performances in the run, so while they may not be injured, they may be dancing in the place of others who are, and as a result need days off to recuperate. Please keep an eye on the website and on our social media feeds for any cast changes for upcoming performances. We look forward to welcoming you again soon, and apologies again for any disappointment. May I just say a word in the Royal Ballet's defence? Of all the ballet company's, I would say that the Royal Ballet is the least likely to change cast members. In this case I happen to know that two other dancers were ill and injured which meant that their places had to be filled which had a knock-on effect on other performances. Dancers have to be scheduled for proper rest periods, they can't do performance after performance. PLEASE release a DVD which includes Thiago and Marianella dancing that sublime pas de deus from Wheeldon's After the Rain.....they are peerless, and this beauty should be preserved forever. Thank you. What a wonderful evening, Yanowsky was sublime in After the rain, and Flight Pattern was extraordinary, very very powerful. MArcelino Sambe is a very exciting dancer. 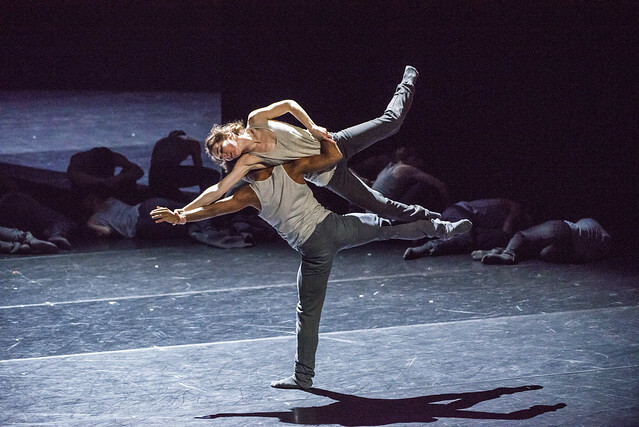 Flight Pattern - powerful and compelling, brilliant sets and lighting, magnificent dancing from all the dancers but especially Kristen McNally and Marcellino Sambe, who can move you to tears. Loved Human Seasons. Zenaida was beautiful in After the Rain- will miss her when she leaves the company after June. Great to see After the Rain once again. Yanowsky and Clarke were eloquent in the pas de deux. Flight Path was magnificent. The powerful imagery is still in my mind today. How wonderful to see the corps choreographed with such imagination and expressive power. The subtlety with which small groups and individuals moved from the crowd and back again was brilliantly handled, and Marcelino Sambe shone once again (what an asset to the company). The sets, lighting, and (beautifully chosen) music worked sublimely together and I look forward to seeing it again - next time, one hopes, not in combination with Human Seasons. With reference to the cast change mentioned above in relation to Muntagirov. It said on the cast sheet simply that he replaced Edward Watson, not that Edward Watson was ill or injured. So it didn't sound 'last minute' but the change was announced online only the day before the opening night. My sympathies to those who are complaining. Of course, people buy tickets to see a particular programme but very, very many are also influenced by a desire to see individual dancers. And, unless there is a last minute emergency, much more notice should be given if a leading dancer is to be swapped from one cast to another (as appears to have happened here). I am not quite sure how a dancer is supposed to 'give notice' of an impending injury. My point remains - all events which involve human beings are fallible and The Royal Ballet have an excellent record of maintaining casts. Bravo, Flight path is a brave and profound exploration of the refuge crisis. Went to Tuesday's performance. Flight Pattern unique and unforgettable. The classic After The Rain pas de deux with Yanowsky and Clarke beautifully done. Human Seasons superb start. Another terrific evening with the RB. If you are considering going, GO! In view of today's press coverage concerning The Human Seasons, I want to send an enormous "thank you" to the Royal Ballet's wonderful dancers for the commitment they are showing throughout this triple bill. They are extraordinary artists who do not simply entertain us or make us gasp with admiration but nightly stir our emotions and lift our spirits. We are so fortunate to have you all in our lives. Human Seasons is however a really weak piece, not deserving of the attention created by the tantrums of the choreographer and stager. Very surprised Dawson's dreary and derivative piece was given a repeat airing. But the After The Rain pas des deux and Flight Pattern are really great, so the evening builds satisfactorily. I have only just heard about the fuss over the Human Seasons reviews which seems bizarre (considering what London just went through on Wednesday, we're very lucky to have ballet performances this week at all, and considering there was another Dawson ballet opening in the US in the same week)....one would think there were more important things to fret about. The Human Seasons isn't a new work anyway- it was made in 2013 on almost the same first cast (except Melissa Hamilton who is currently dancing in Dresden; and Steven McRae who is preparing other roles), so the steps should be familiar territory to the dancers who performed when critics were present last week. The comments about being unwilling to try something new seem odd. You can't please everyone all the time- expecting that you can is unrealistic; even Balanchine, Bejart and MacMillan received negative reviews. The most popular dancemakers who sell out shows and are in demand around the world today get negative or lukewarm reviews too- which don't stop audiences going back to see their ballets, even repeatedly! A look back at the feedback in 2013 showed many people who praised THS, while this season there were people (including me, seeing the ballet for the first time) who wrote that they liked it and certainly the audience reaction at the performance I attended was very enthusiastic for THS. Reviews are opinions (whether positive or negative) and not fact. The only facts are the number of tickets bought and the number of people in the auditorium, and perhaps the volume of the applause/cheers. From feedback that choreographers and former colleagues have expressed about the current members of the company, the constant refrain is their enthusiasm, diligence, their rapt attention and great skill. And whatever the difficulties of the rehearsal process (as any dance work will invariably bring when cast changes are involved), the Royal Ballet dancers always show off the ballets in the best possible manner when they dance it. Even when I haven't liked a new ballet, the dancers have performed it with 100% commitment. Thank you Royal Ballet dancers, and thank you Kevin O'Hare, keep up the good work and the wonderful performances. And thank you to all choreographers and repetiteurs who take risks and work hard to put on great shows, year after year. Of the three ballets in this mixed bill Flight Pattern was by far the most interesting and it was compellingly danced by its cast. After the Rain really is a ballet of two parts the pas de deux as danced by Yanowsky and Clarke was quite extraordinary. I am afraid that I don't find the first section half as interesting and the low lighting levels do not help..
As far as I am concerned the least satisfactory ballet of the three was Human Seasons. I find it difficult to understand why this ballet was revived I find it as devoid of interest as it was in 2013 and I seriously considered arriving late or sitting outside the auditorium. But then there is always the hope that a different cast will reveal that the work contains something which other dancers have failed to bring out in it. As far as I can see the cast did their utmost to make this vacuous piece of choreography work. It seems to be full of clever partnering and images such as the "vacuum cleaner";women being moved across the floor on their fronts and a great deal of pointless running around. Perhaps I missed something but the dancers did keep merging into the background if not disappearing because of the designs and the lighting scheme. The low lighting levels for Flight Patterns were carefully judged and seemed devised for artistic effect. I feel sure that I saw everything that the choreographer wanted me to see. I am far from sure that is the case with Human Seasons. As a general comment I am afraid that I am beginning to resent the effort that I am forced to make to watch dimly lit dance works which are so often appear to be devoid of real choreographic content. .May I ask whether any one, say the choreographer, ever ventures into the Amphitheatre to see what their masterpieces look like and whether they are actually visible from the top of the theatre ? I know that tickets warn the audience when seats do not give a full view of the stage perhaps the ROH should add warnings about lack of visibility because of low lighting levels. Well said, ElleG. I haven't seen this triple bill but in the light of the press coverage I must add that the commitment, professionalism and wonderful artistry of all the dancers cannot possibly be called into question by anyone who has seen them perform, in anything. Long may they continue to delight us. I too would like to thank the magnificent RB dancers for the artistry and commitment they bring to all the works they perform, no matter what is being asked of them. Any choreographer or stager who has the opportunity to work with them is indeed blessed. I found Flight Pattern profoundly moving and also visually and conceptually thrilling, and I very much hope it will return. After the Rain seems rather disjointed and incomplete, but the pas de deux is absolutely beautiful and was superbly danced by Yanowsky and Clarke. As for The Human Seasons - I found some of it beautiful, but I grew weary of the endless manhandling of the women and there was also rather a lot of slightly aimless running around. In my view it was extremely well danced and was shown to its best possible advantage by these brilliant dancers. This triple bill was a good balance of pieces. After the Rain, a long standing favourite. Flight Pattern, mesmerizing as a whole. However Human Seasons is in reviews, here as elsewhere, not given it's rightful due. I liked the choreography, mixing solos with multiple couples on stage, all flowing seamlessly into each other. The cast I saw, Zucchetti,Edmonds,Takada,Hayward,Stix Brunell,Naghdi, Ball, Montano et al, were giving it their utmost and did the choreography justice. In general I know, being an avid follower of Royal Ballet, that its dancers are all extremely professional. They committed fully to this piece and danced it well. Not only that, all these dancers enthral us night after night, and train equally hard on nights they are not performing to maintain their form and technique. I want to thank them all for their professionalism and commitment, and for enriching the lives of those who watch them. So Thank you Royal Opera House and Thank you Royal Ballet. Through sharing their Art, beyond a wonderful evening out, dancers have a great influence on many people's lifes. Thank you ! Agree wholeheartedly Marguerite. Thanks for putting this so eloquently. were beautifully balanced. A great achievement! I took two newcomers to ballet. They absolutely adored this Triple Bill and its variety of styles and dancers. I personally LOVED the background of Human Seasons. That beautiful midnight blue combined with gold was so very stylish, the dancers' leotards gorgeous and their dancing so impressive. I saw the cast with Yasmine Naghdi and Matthew Ball as the Principal couple and they honestly moved me to tears: the flow of their movements, Yasmine Naghdi's stunningly clean line, her strength, their tenderness for each other oh what a joy it was to watch them. The other dancers gave it their all too I felt. After the Rain was very different and I loved the Pd2. The Pike piece provided yet again another style and it was very moving. I am so full of admiration of all the Royal Ballet dancers, they are topnotch and fully deserve my praise and great admiration. What an artists they all are!!!! My apologies- I got the date of Mr Couchman's complaint in response to the Artsdesk review mixed up. I thought it was posted on Thursday 23 March and not the actual date of 20 March. My fault for trying to read it on a dim touchscreen. Please ignore what I said about London! Extraordinary commitment from Royal Ballet for The Human Seasons on Thursday but I struggle to see any differentiation between the seasons and do find parts of the ballet pretty ugly and demeaning for dancers and audience. Very much enjoyed After the Rain - hadn't appreciated it was Marienela's birthday until much later and a lovely birthday present from her and Thiago for all who were there. Flight Pattern shows how ballet can successfully explore critical issues when we are fortunate to have such a fine choreographer as Crystal Pite and the wonderful Royal Ballet dancers and orchestra - massively thought provoking and a real triumph. Points above taken about cast changes being unavoidable. It was very disappointing on Friday 24th though as 4 out of 5 principals were replaced - Muntagirov, Bonelli, Nunez and Cuthbertson. The only principal left in the whole programme was Lamb. I couldn't help feeling disappointed - in particular I thought Stix-Brunel and Underwood were not 100% in the After the Rain pdd. Loved After The Rain absolutely beautiful also The Human Seasons both quite special to watch. Disliked Flight Pattern and found it tedious, boring and endless. Long sigh... I will never see these ballets. The cost of travelling to Sydney or Melbourne, then the added (whopping) cost of entry is simply beyond my means. I will never travel to the UK and so I will never get to see my favourite dancers (Mr Sambé, Ms Nunes and Mr Soares). All those of you complaining, please bear in mind that at least you could attend and see SOMEone dancing in SOMEthing.